U.S. & World Early Warning Report™. This book answers questions such as, are we headed for fascism like ancient Rome? Mr. Maybury uses historical events to explain current events, including the wars in the former Soviet Empire, and the legal and economic problems of America today. History does repeat. To build a better future we need to know how we got where we are today. The political trend that has dominated the world for 2,000 years, including the investment markets, remains almost unrecognized. Does America have the Roman Disease? Is there a cure? 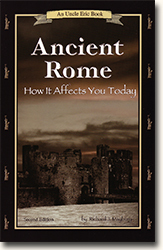 Or will America repeat the mistakes of Ancient Rome and collapse into poverty, ruin and war?